If you know me, you know I'm a lover of the beach. I also love all the things that come with it. The hot kisses from the sun, the sounds of the waves, the glow of the moon over the ocean and the salty mist in the air. Do you ever wish you could get your hair to have that sea salt texture it gets from a day on the beach? 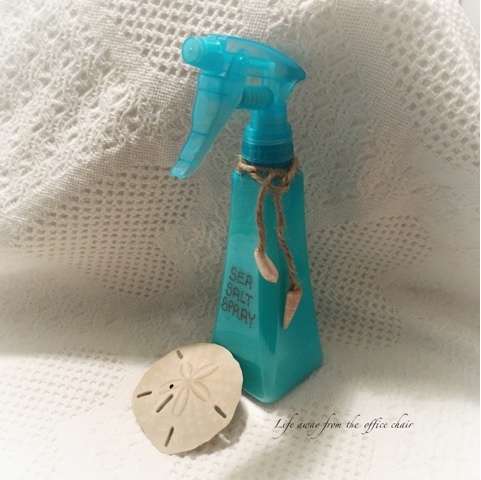 Well I'm here to show you how to make your own sea salt spray for your hair. I apply this fun spray on my hair often. It gives your hair texture that makes it easy to manage the tousled or scrunched style. It does not weigh your hair down. My hair is short so I just get the messy look but if your hair is long, you ll have those loose wavy beach locks that are soft and bouncy. It cuts my styling time in half. 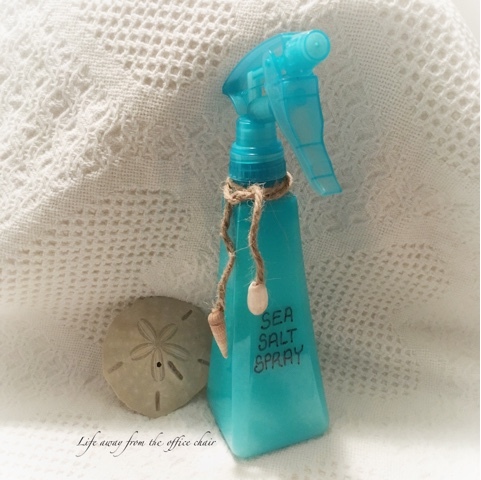 You can now buy sea salt spray in the stores but its more fun and cheaper to make your own. 1/4 cup of warm water and let the salt dissolve. Add 4 oz of your favorite smell good conditioner. Apply to clean towel dried hair working it in with your fingers or comb. Dry and style as usual or Scrunch and go. Guys, this will work for you as well. Works great after swimming to tame and tousle your hair for the perfect beach look. Just spray on damp hair, run your fingers through it and let it dry by the air and sun. I'll be useing it alot during next weeks beach trip. Thanks! Hope your feeling better. I hope you are happy, I can skip this post on HAIR! ;-) hahahahahahahahahahaha There are some tings I miss, carrying a comb in my back pocket! Nice! I would love this with a coconut scent, to really get that whole beachy feeling going on!! Thats what I do. Thats the whole Idea. What a neat idea. And so easy to make! Yep. And you can add more or less of each ingredient too depending on you your hairattude. Boy! You need to drive until the map turns blue! Hmmm...never thought about trying that. Everything weighs my hair down. I don't even use conditioner. But it's worth a try. Thanks for sharing. Have a great time this weekend! You can add less conditioner. Lisa, no beaches here, but this sounds awesome! Sometimes I like to just wash and scrunch my hair for a carefree look. I will definitely be giving this a try! Thanks for sharing with SYC.